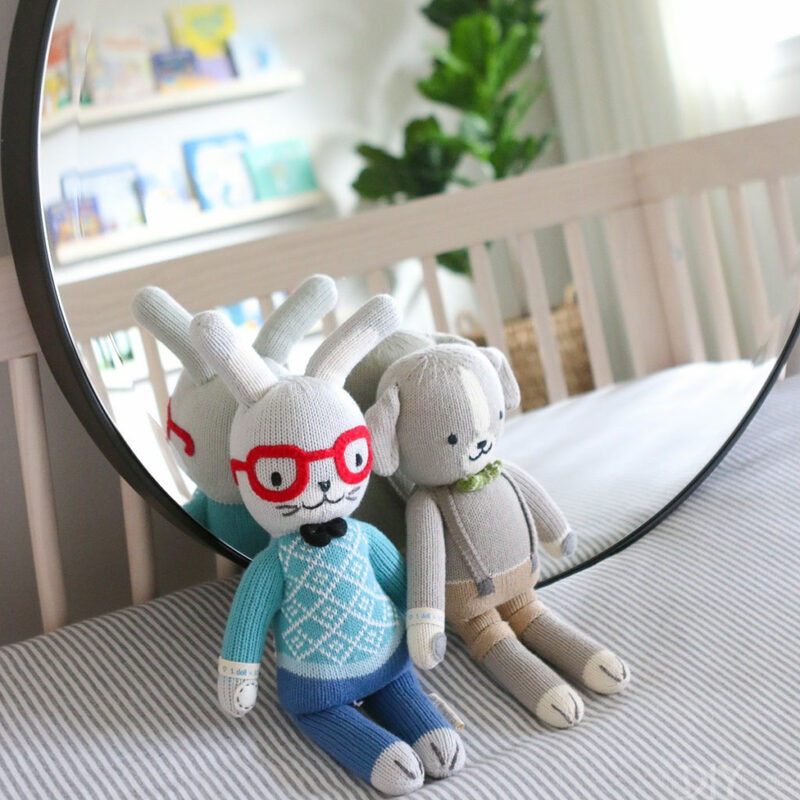 Decorating a nursery for your baby is a special time. As a soon-to-be new mom, every single piece of clothing, blanket, stuffed animal and tiny accessory I see seems way too cute to be real. I still can’t believe I’ll eventually have a little one that will fit into these tiny clothes and use these adorable toys! But when it comes to decorating our nursery, I’m trying to restrain myself from buying all these cute things. 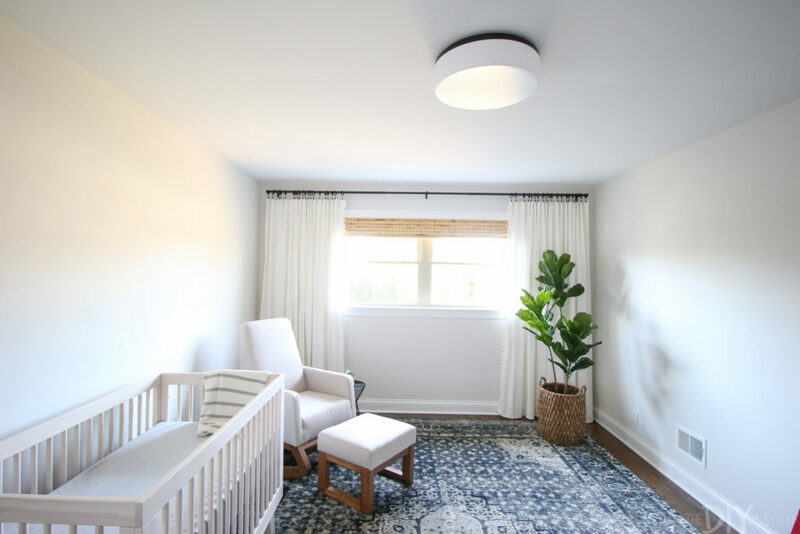 That’s because I’m trying to decorate this space with intention so that the nursery will grow with my baby as he becomes a toddler … and even a little boy. I don’t want to invest more money in different furniture, rugs, or new paint in a few short years all because I wasn’t planning ahead and creating a space that will transition with him. 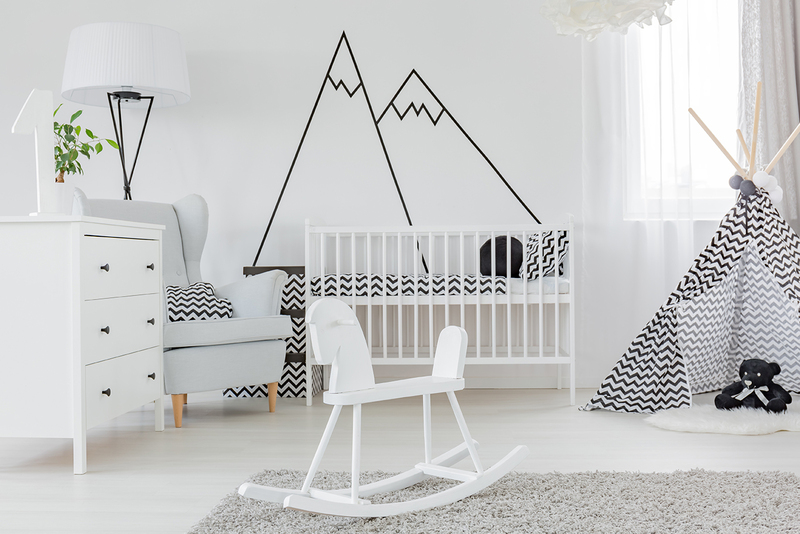 Are you excited to decorate your nursery but don’t want to be re-decorating the nursery in a few short years? 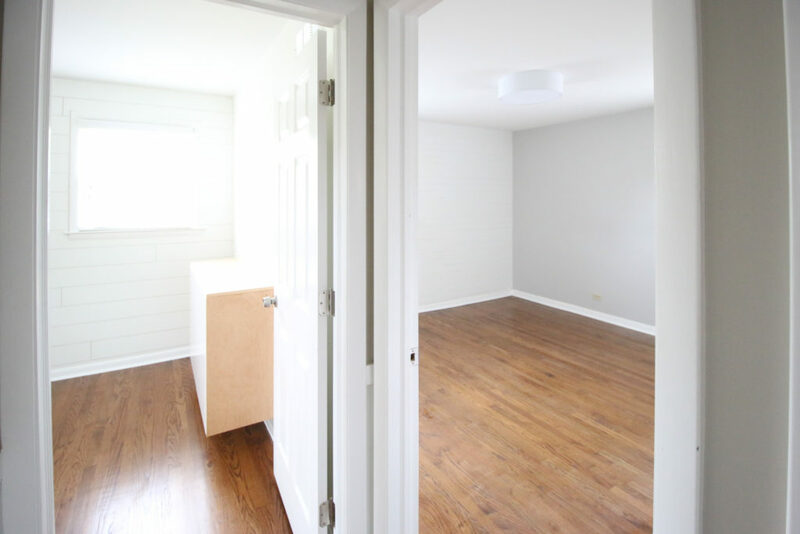 A room that will be oh-so-adorable (and functional!) now, but will also be age-appropriate without a ton of time and money? Here’s how I made my nursery future-proof. From the top, this is the most obvious, yet the most ignored piece of advice. It’s natural to hear “It’s a boy!” and immediately starting planning a traditional light blue nursery. But thinking outside of that box is a great first step in making sure your nursery will grow with your child. 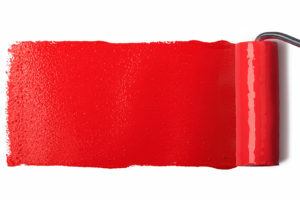 Zillow examined 50,000 home sales and found these colors help sellers make as much as $5,000 more! 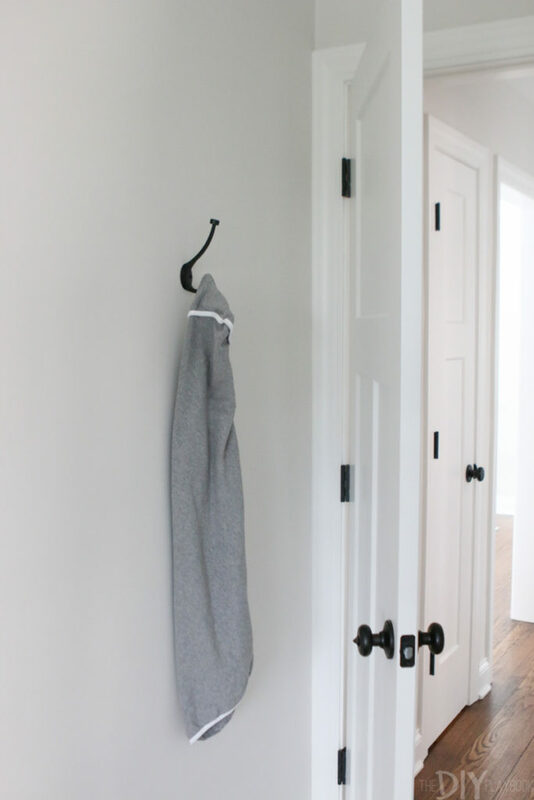 So to all the excitable parents-to-be out there, we suggest a neutral wall color. You can always accessorize with those bold, bright, or traditional nursery colors in a less permanent way. Future-you will thank you. Protip: Wall decals, or “wall stickers” are increasingly becoming the “temporary tattoos” of the home-deco world. 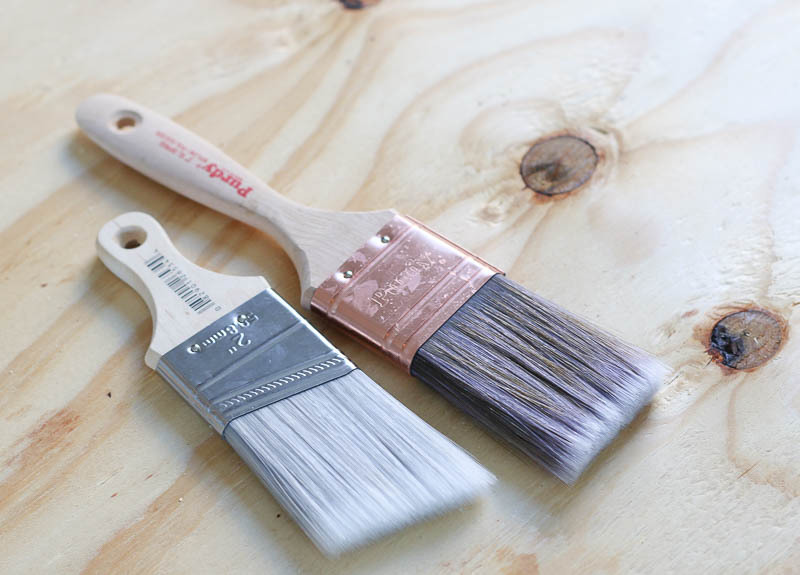 Most of them are easy to apply and easy to remove, so consider going this route if you absolutely have to plaster something across your wall. Amazon is just one place with plenty of options. 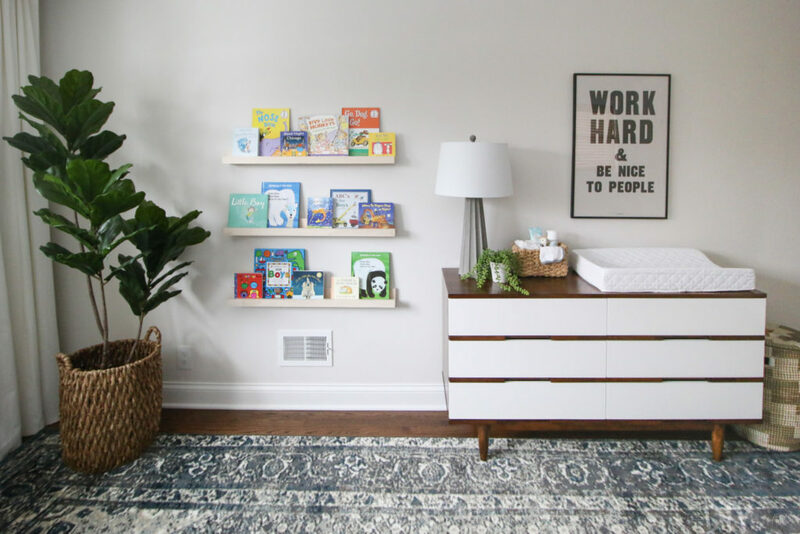 This is probably our biggest piece of advice because it will have a large impact in creating a nursery that will grow with your baby. Yep, she looked at us like we were straight crazy when we declared that there was no theme. 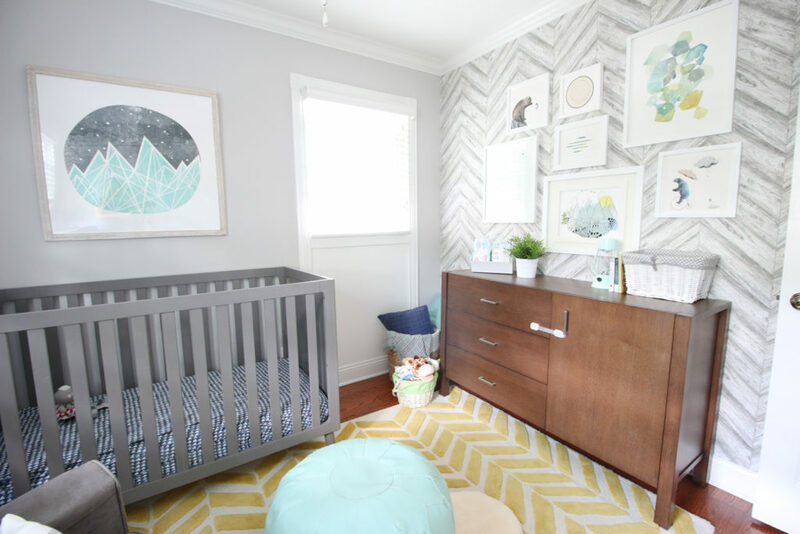 But skipping this theme will help the space transition later on because themes often make a nursery feel very “baby”. Themes can’t transition. Not to say that you can’t incorporate some aspects of these cute collections, but steer clear of buying an entire set of bedding, decor, textiles, etc. That is, unless you want to start completely over as soon as you’re sick of it. Buying the right furniture will also be another way you can save money in the long run. Investing in pieces don’t look like they are only for babies will prevent you from needing to replace these pieces in a few short years. 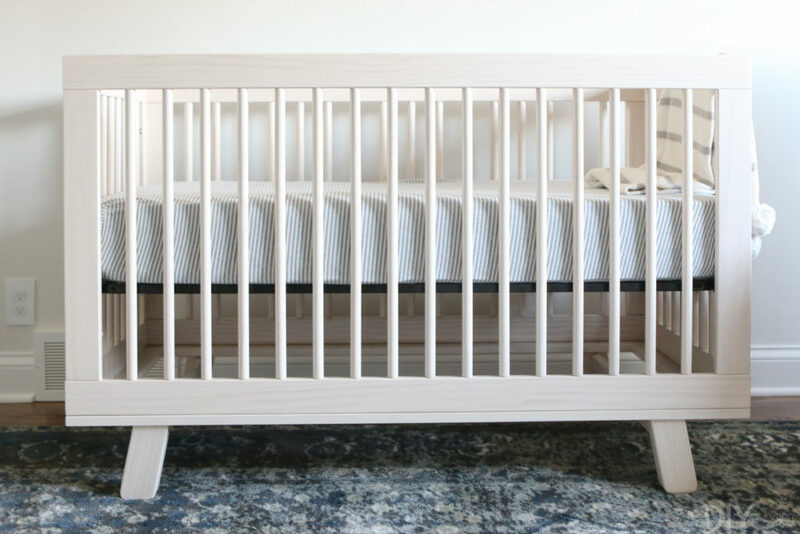 A lot of cribs these days are considered to be convertable cribs, or 3-in-1, which means they will transition from a crib, to a toddler bed, and then eventually to a twin bed headboard. 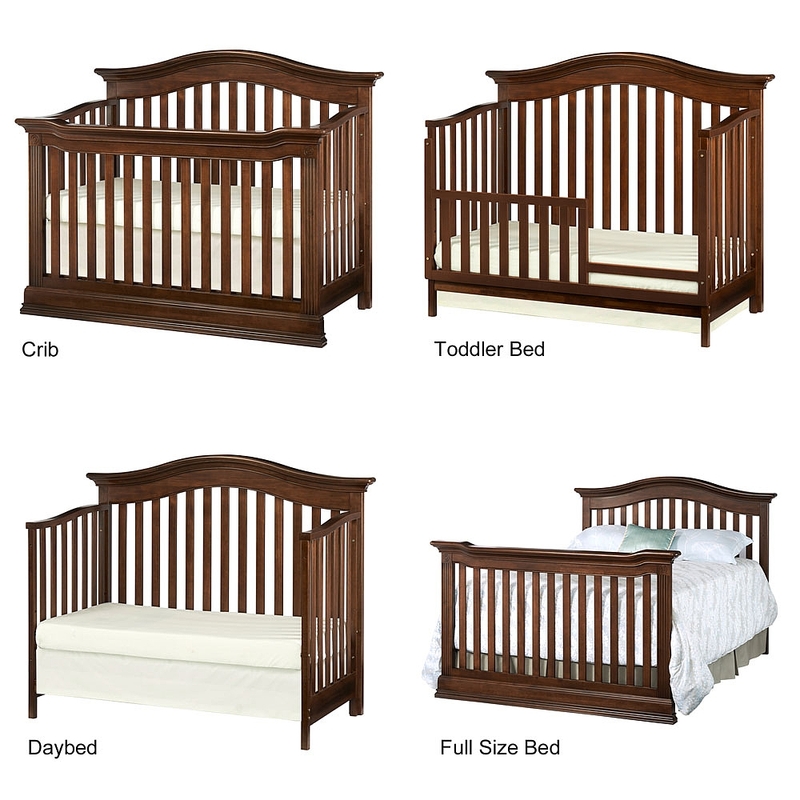 Wayfair has a nice spread of potential crib options. Also, skip the traditional changing table and opt to buy a regular dresser that you can add a changing pad on top of. That way, you won’t have to ditch the changing table for something less specific in a few short years. You just switch out the changing pad and use the same dresser in a big kid room! 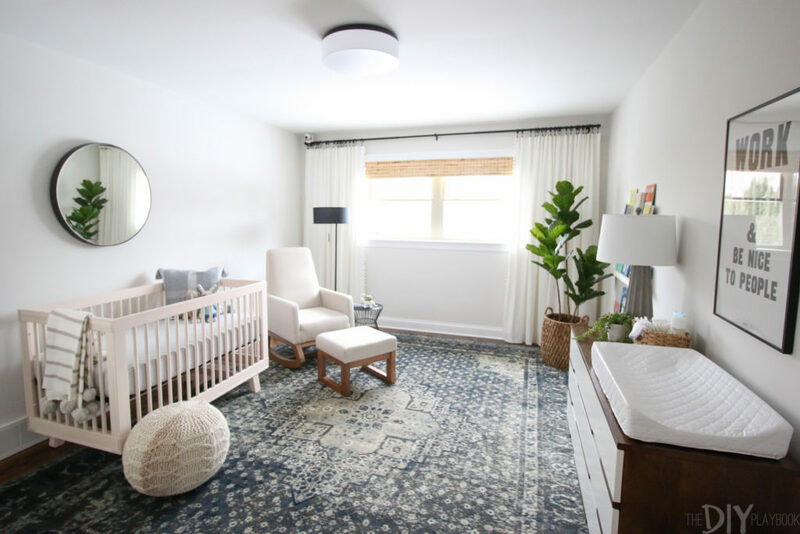 Transformable and “big-kid” furniture for a newborn will save you lots of money in the long run, and you might find a lot of companies are finally starting to realize this when you check out baby furniture options out there. 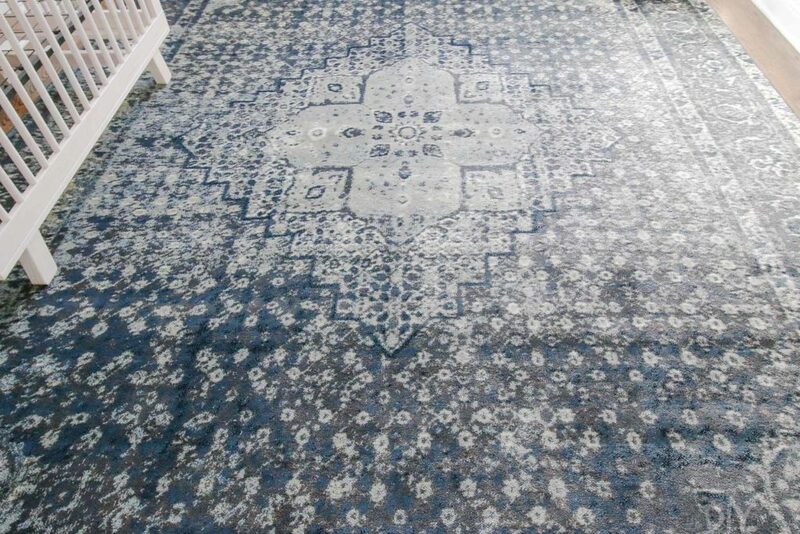 If you have hard floors, we recommend a rug to give your room a softer area to eventually crawl around. And if you choose a pattern, texture and color that isn’t strictly for a nursery, it can live in that space for years and years. We went with this dark oriental-inspired rug because it will not only hide stains, but it can transition as the baby gets older. It is also super versatile so it can adapt to match all kinds of decor, pillows, art, etc. This large rug was definitely an investment, but we don’t plan on moving it for a long time, which really helps to make you feel comfortable spending money on something expensive now. Creating a bedroom space that works for your everyday needs is important regardless of how old you are. 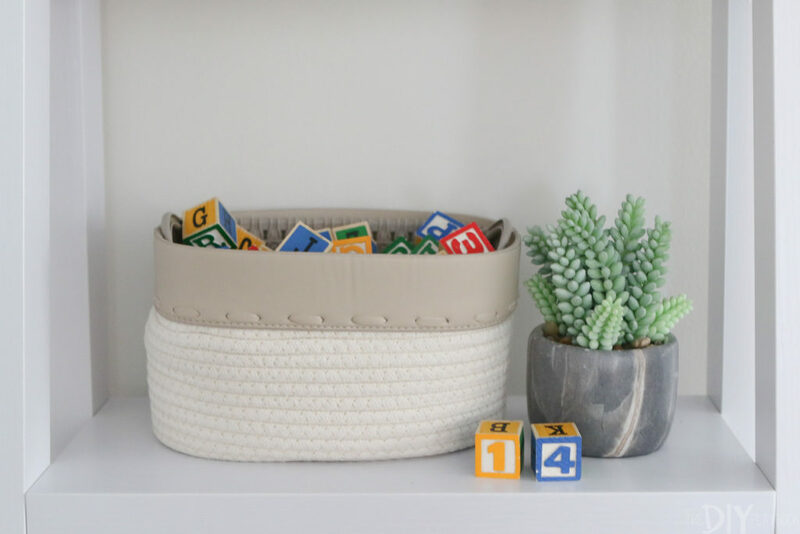 From newborns all the way up to adulthood, you want your room to be organized and functional to meet your everyday routine. But a newborn’s needs/routine will look very different from a small child’s, right? That doesn’t mean you can’t establish organization systems early on that will grow with your baby. The first thing we did was add hooks to the walls. Today, they work for a baby’s towel, but later on that same hook will be a perfect spot for your little one’s book bag. 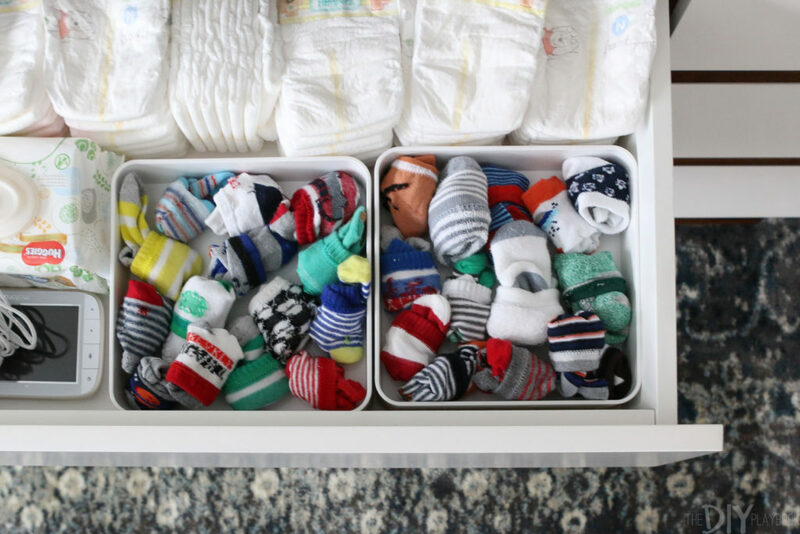 A closet organization system that works for your little one’s diapers will one day be useful for them to pick out clothes. And yes, the more organized you are now, the more you will appreciate and maintain these methods throughout the future. Last but certainly not least, it’s time for the fun part: accessorizing! So if you can’t help but splurge on that adorable stuffed animal or that super cozy baby blanket, do it! The necessities in the room will be there for the long-haul. 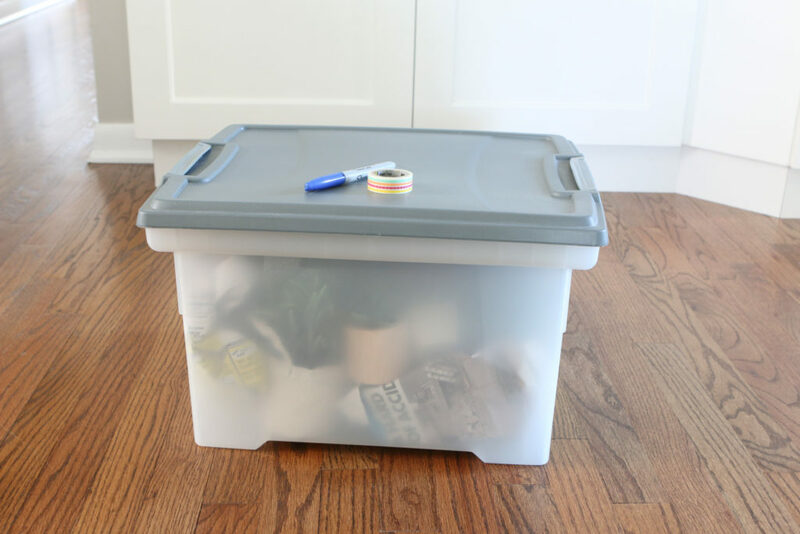 As the years go on, now all you have to do is swap out a few accessories, which is far less intimidating than new paint, furniture, new rugs and a whole new theme! Moving while pregnant is an adventure! 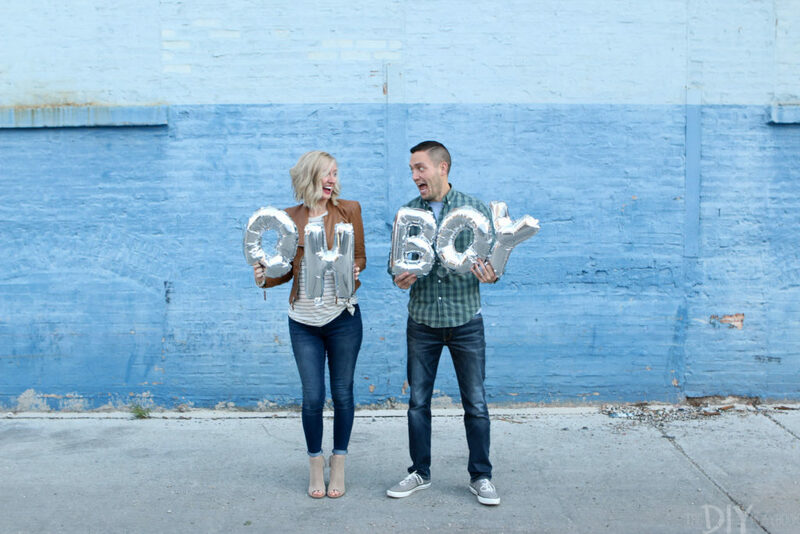 When my husband and I found out the exciting news that we were expecting a baby, our first thoughts were obviously to be beyond thrilled and extremely grateful. Can you tell? However, soon after the initial news that we were having a precious baby boy, we discovered a house for sale in our dream neighborhood, which then immediately prompted us to put our current house on the market. The sellers of our dream house accepted our offer and within 48 hours, we also accepted an offer on our current home, which we had lived in and loved for the past five years. All while we had planned to do nothing other than being pregnant! Luckily, we managed to do it all. Yep, I accomplished moving while I was pregnant. Overwhelmed by the thought of moving while pregnant? I was too. New house in our dream neighborhood—check! 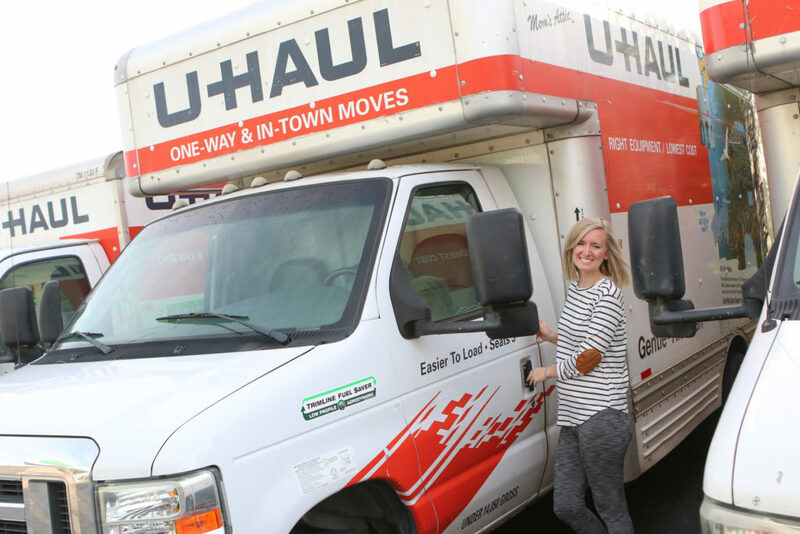 Moving while pregnant … eek! I didn’t exactly see that coming. And I was a bit overwhelmed at the thought of tackling a move with a baby on the way. For the record, I was in my second trimester when I began planning for my move, heading rapidly towards my third trimester. Spending the final months leading up to our first child packing, moving, unpacking, and renovating was overwhelming to me. But life happens and I had no choice but to make the best of it. And I’m here to report that I survived! I learned a lot along the way. I turned out not to be completely useless while helping. My biggest fear when I found out we were moving while I was pregnant was that I wouldn’t be able to help with anything! For context, I’m a “Type A” personality who enjoys being busy. A surprising source of stress? The thought of leaving my husband with our entire to-do list while I sat back and watched was extremely stressful! But I was pleasantly surprised to find out that I was far from useless during this time. My husband and I worked out a system where he would build the boxes, I would organize, pack and label the boxes, then he would stack them all up. Packing was a total team effort, which made me feel productive and my husband was genuinely grateful for my help. Yes, I made sure to take care of my body, take it slow and avoid lifting heavy boxes during the process, but honestly, I was fully capable of just about everything else. 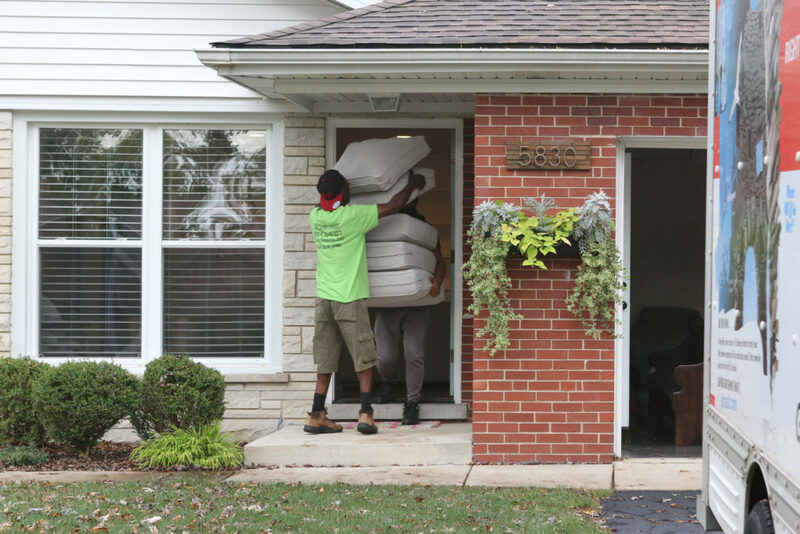 If you find you might be moving while pregnant, one solid teammate might be the only thing you need. Moving day was also a stressor for me because again, I felt like I was going to be totally in the way. I’m happy to report ladies that once again, I was wrong! 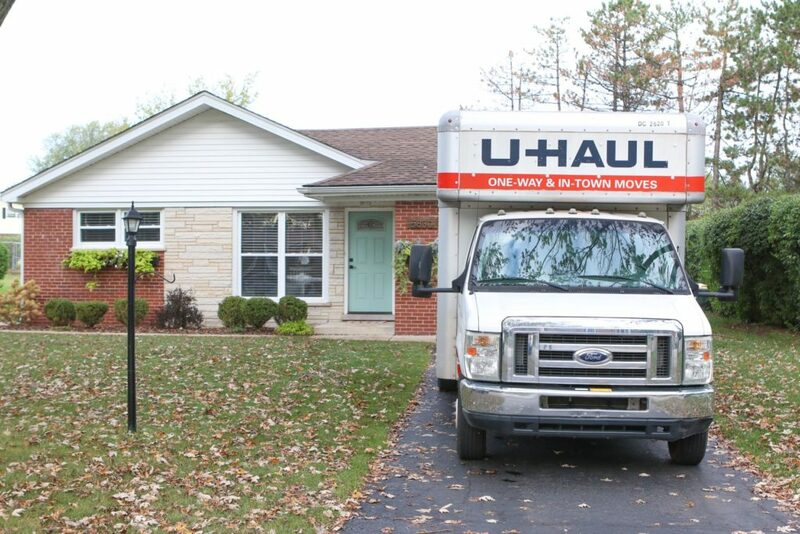 We opted for a Hybrid Move, which is hiring movers and renting a truck separately to save a lot of money. I was fully capable of picking up the U-Haul and driving it all day. So although I couldn’t lift heavy boxes, I absolutely was contributing in a big way by driving the truck. I was also able to help oversee the move by organizing which boxes and furniture ended up where. It turned out that it was really helpful having one point-person that wasn’t carrying boxes, but rather solely focused on making sure everything ended up in the spot we had planned. Plus, getting each box into the correct room was super helpful towards keeping me involved in the unpacking process. I highly recommend this point-person/direction technique, pregnant or not! I didn’t have to bring a certain box to a specific room for unpacking, which meant the boxes were already there, which made getting set up in our new house a lot more efficient! Hiring movers ended up being necessary. 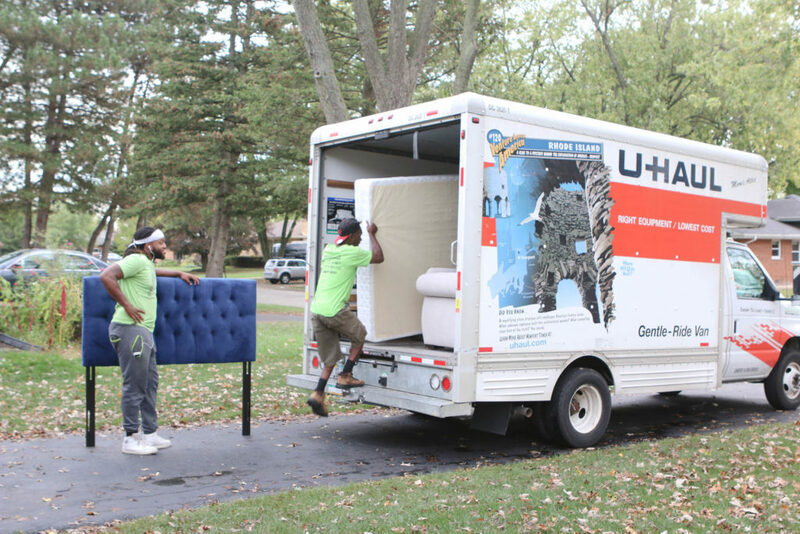 Although I felt like I contributed a lot before, during and after moving day, I don’t want to give anyone an unrealistic expectation that you’ll be able to do everything on your own, given how intense moving a home truly is. I can honestly say that hiring Helpers as a part of our Hybrid Move was the best investment we could have ever made, pregnant or not. We needed them that day and appreciated their help more than we could have ever anticipated. Having them to do all of the heavy lifting took the responsibility off of my husband, but it also kept me from feeling bad about not being able to help him with the big stuff. Our Helpers were able to pick up all of our stuff from the old house and bring it to our new house in less than three hours! My husband and I weren’t stressed at all, which made the process a lot more enjoyable and probably kept the baby healthier. I would definitely recommend hiring help, regardless of whether you’re pregnant or not. But if you are expecting a little one, I have firsthand experience that this is money well spent. Leaving my old home was harder than I thought it was going to be. Okay, I blame this part on my pregnancy a little. But in all actuality, the emotional roller coaster that came with leaving our old house will probably be the case for many of you even if you aren’t pregnant. Leaving our old house for the last time was a lot harder than I ever expected. My husband and I bought this house when we got married and I guess I always pictured we’d someday bring our baby home here. But we were already outgrowing this 1,000 square foot house well before we got the exciting baby news. Cue all the tears here! I guess the baby was the excuse we needed to finally make the move. But that still didn’t make leaving this house any easier, and whatever your own circumstances are, it might not be easy for you either. The good news is that the sadness didn’t last too long because there were exciting things ahead. Those exciting things? Starting a new journey by preparing the new house for your new family! The nesting phase is no joke and may come at the perfect time if you’re pregnant and moving, like me. I’ve been able to get so much done in the new house because of the baby deadline that is coming closer. Sure, setting up a new house is a ton – especially while pregnant – but I’m feeling a constant fire under me to get as much done as possible so we’re settled in before the baby arrives. Of course, I still need to be conscious of my body’s limits, and you should be too. I’m working hard to stay busy throughout my second and now third trimester. Thanks to all that hard work, I survived moving while being pregnant and now I am so thankful we were able to get the move out of the way before the baby comes. Now I can’t wait to invite our new baby into our new home!